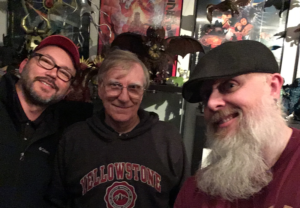 12.06.2017: Ed Godziszewski & Steve Ryfle Return! Steve Ryfle and Ed Godziszewski chat with Kyle about their recently published biography of the director Ishiro Honda. This episode was recorded last month, just before a local Portland theater hosted a screening of Mothra featuring my two guests, the authors of Ishiro Honda: A Life in Film, from Godzilla to Kurosawa, Ed Godziszewski and Steve Ryfle! No strangers to the Kaijucast, I was thrilled to have the both of them in the studio at the same time to talk about their working together both on and off the book. If you aren’t familiar with their collective work, and feel lost at all during the conversation, I also spoke with Ed while in Chicago for a G-Fest (episode 95) and Steve while visiting Los Angeles (episode 92). It’s always a pleasure to have these guys be part of our little radioactive dinosaur radio show, and if you must know, I am reading their book….just very slowly. But I’m definitely going to keep it up until I know all there is to know about Ishiro Honda! Don’t forget to send in your homework (aka your thoughts, questions and reviews) for this month’s discussion film, Reptilicus (1961) before December 21st to be included in the episode!